In this review we have attempted to set the subject of molecular fracture in the context of the various theories applying to macroscopic or engineering fracture. Two regimes of fracture have been identified, namely a thermally activated Regime I dominated by bond fracture processes and a mechanical Regime II which also involves molecular fracture via the surface energy term but in which mechanical loss processes control the resistance to fracture and its rate/temperature dependence. Experimental studies of molecular fracture cannot be used directly to predict macroscopic fracture properties, for various reasons. Firstly, in Regime II, resistance to fracture is controlled largely by flow processes which do not involve molecular breakage. Secondly, even in Regime I, where mechanical losses are negligible, there are processes intermediate between molecular fracture events and macroscopic failure. Such processes include the redistribution of load between load-bearing molecules, microvoid formation and growth and crazing. In spite of the difficulty of establishing direct correlations between macroscopic fracture phenomena and microscopical molecular fracture phenomena, the large amount of work carried out in recent years on the application of ESR and other techniques to molecular events in stressed polymers has brought us much closer to success. 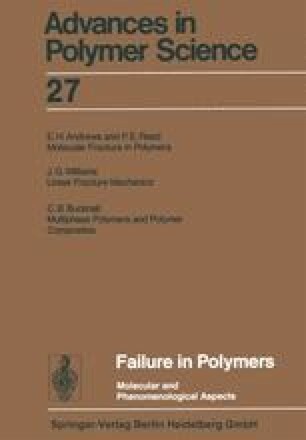 In particular it can now be stated in broad terms but with some confidence just how far the breakage of molecules within a stressed polymer contributes to macroscopic deformation and failure in any particular case. Work will no doubt continue with a view to reconciling even more closely the microscopical and macroscopic descriptions of fracture phenomena.